Jake Cox, from Aberdeen, is among those to have seized the new opportunity. North East Scotland College is offering a new form of apprenticeship to youngsters from the area. Foundation apprenticeships have been set up across the country since 2014 after the Scottish Government recognised the need to balance academic and vocational learning in secondary schools. The college is now offering people the chance to gain qualifications in social care, engineering and health, and children and young people. 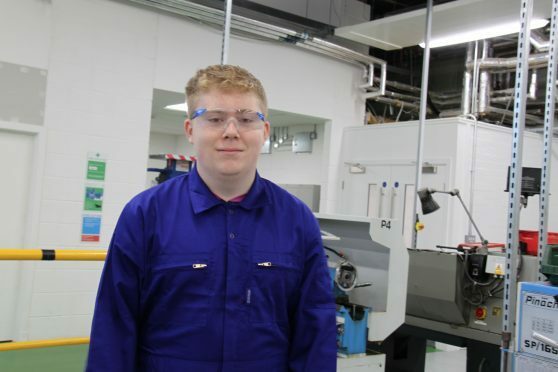 The 16-year-old is juggling his fifth year at St Machar Academy pupil with a foundation apprenticeship in mechanical engineering. As part of this, he travels to the Fraserburgh campus every Wednesday. He said: “The facilities here are amazing, much better than at school. “I’ve enjoyed everything so far and to be honest, it is so much better than I thought it would be. “We’ve covered computer aided design, dynamics and statics in the classroom and we’re now based in the workshop. During his two year apprenticeship he will undertake 300 hours of work experience and gain a qualification. Shelley Mackenzie, the schools liaison manager at the college, said there were plans to develop more foundation apprenticeships for the next academic year. She said: “For a number of years North East Scotland College has partnered with Aberdeen City and Aberdeenshire councils to offer a range of vocational courses to pupils as part of their senior school timetable. “Foundation apprenticeships fit well with this activity as they offer a blended learning experience allowing pupils to stay at school to take school based subjects whilst also accessing a college education alongside extended work experience opportunities. “This blended senior phase experience will really equip pupils with both the knowledge and skills they need for entering the work place.